A London, Ont. hospital policy that flags patients with a history of violence or the potential for violence is necessary to keep workers safe, the president of the union that represents 3,000 nurses says. James Murray is a registered nurse and president of Local 100 of the Ontario Nurses Association, which represents nurses at the London Health Sciences Centre where a violence assessment tool is being used to flag patients. Patients who appear agitated or confused must wear a purple armband. If they refuse, they are given a large exclamation mark outside their door. 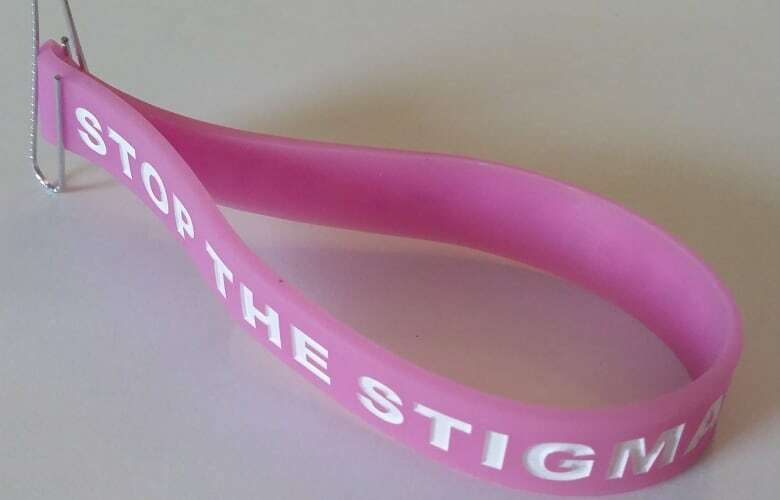 Psychiatrists and those who work with mentally ill patients have been wearing "Stop the Stigma" bracelets since the violence assessment tool was introduced in May. They say the policy unfairly targets those with mental illness. On Monday morning, Murray spoke to CBC London Morning host Julianne Hazlewood. CBC: What happened to change the way LHSC assesses patients for violence? James Murray: I just want to be clear. This is not a new policy. This policy for flagging and managing violent behaviour has been place since 2009. CBC: But the armbands have been since place since May? JM: No, since 2009. What has changed is a violent incident where a nurse was assaulted in April of 2017. It was unfortunately an individual who had a long history of sexual aggression and violence, was not flagged by the physician. The Ontario Nurses Association asked the employer to investigate, and they did. We were not satisfied so we called the Ministry of Labour, and of course the Ministry of Labour came in. Unfortunately we felt they didn't do a satisfactory investigation as well, so we appealed the orders that the inspector had provided. CBC: You're saying that people have been getting purple armbands since 2009? CBC: Why are these armbands important? JM: It's important because if you look at the statistics of violence, they're going through the roof. [An] estimated 50 per cent of health care workers have said they've been assaulted at some point in their career, 28.4 per cent of those who responded to a national survey about the work and health of nurses said that they'd been assaulted in the previous 12 months. 44.9 per cent report that they've been subjected to emotional abuse in the workplace. And if you look at WSIB data, 56 per cent of all lost time injuries due to workplace violence in the hospital sector occurs among registered nurses. This can't continue. This is not acceptable. CBC: There are concerns that this tool unfairly targets patients with mental illness. How do you respond to that? JM: The tool does not target patients with mental illness. It applies to all patients in the hospital, as well as outpatients who are screened. It doesn't target mental illness patients at all. CBC: There are screeners only on the psychiatric units of the hospital. Doesn't that suggest they're being singled out? JM: Every registered nurse who [first encounters] a patient, that patient is screened. What has happened in the outpatient [psychiatric] department is that for some reason the leadership decided not to implement the policy, they decided to ignore the memorandum of settlement that was signed by the LHSC and the Ontario Nurses Association, so they have developed this work-around. CBC: The work-around that they have screeners? JM: Yes, the work-around that they have individual screeners. CBC: So there are only screeners in the psychiatric units? JM: Well, no, there are screeners everywhere. Every registered nurse everyone who encounters a patient for the first time is a screener. What's different is that in [psychiatric] outpatient they've decided to identify only the individual sitting at the desk as a screener. But every RPN, every RN, every physician should be a screener. CBC: We've heard from people who say they've been targeted, or their family members, and they say it's deeply, deeply stigmatizing. What do you say to them? JM: I don't think it's stigmatizing. LHSC as an employer has a legislated obligation to ensure that their patients and their staff are safe. The Occupational Health and Safety Act requires that an employer takes every precaution necessary for the protection of a worker. This is a requirement under the act. CBC: Some have said the assessment tool is too broad. We might get agitated or confused at points, but that doesn't make us violent. Do you think the tool is too broad? JM: I don't believe so. It was developed based on validated tools by the Public Health and Safety Association. They looked at the BROSET violence checklist and the dynamic appraisal of situational aggression, both validated tools that are used every day, and they adapted the Violence Assessment Tool from those two documents. CBC: If a person has been flagged as potentially violent, it stays on their chart indefinitely. How are daily circumstances taken into account—a patient's actions, their behaviour up to that point? JM: The wristband is only a cue to any worker that perhaps I may need to take special care in terms of dealing with this individual. In terms of their daily care, nothing changes. Everyone who comes through the doors at LHSC will receive the care that's required. CBC: But what if you feel unfairly flagged? JM: If there is a concern, there's an appeal in the policy. If you feel you've been unfairly flagged, you can make a request for it to be reviewed. CBC: So the only way you can be unflagged is to go through the appeal policy? JM: The Occupational Health and Safety Act requires that a person with history of violence is communicated to the workers. CBC: From your view, does this work? JM: From my view, it does work. CBC: Are these armbands making hospitals safer places for the people who work there? JM: Well, we will know in the future as we look back on the data and determine whether we have seen a decrease in the incidents of violence. CBC: Do you have any data at this point? JM: The employer was to provide data but to this point, they've not done that. CBC: How would you like to see psychiatrists and other clinicians approach this tool? JM: I believe that since this has been in place since 2009, I don't know what's caused the commotion all of a sudden. I believe it's the communication of the message. Historically, professional staff have not been required to follow this policy, but there's been a change where it's a requirement of everybody. I'm somewhat disappointed that professional staff have taken the road that this is something that stigmatizes their patients, when in my view that does not happen. The messaging those individuals have provided to their patients has led to a certain level of frustration and concern that I don't think is necessary. CBC: Have you heard from patients about this policy? CBC: What do nurses feel about the policy? JM: The majority of nurses are satisfied with the tool. Nurses for so long have been subjected to violence and they've been discouraged from reporting assaults. I've dealt with nurses who have been stabbed, who have been sexually assaulted, and it cannot continue. It's not acceptable in any other workplace. It would not be acceptable if I was standing behind a cash register at Sears and someone punched me in the face, it would not be acceptable if I was working at McDonalds and someone threw their hot coffee in my face. But for some reason, it has been acceptable behaviour in hospitals and it can't continue.